If you take on the task of protecting us at various events or venues, dealing with unruly patrons is inevitable. We're happy to now carry this Occunomix Men's LUX-DPSSE-DOR Safety Security Vest, a quality high-visibility vest designed specifically for public securi ... (see full details) (see specifications) #LUX DPSSE DOR. If you take on the task of protecting us at various events or venues, dealing with unruly patrons is inevitable. We're happy to now carry this Occunomix Men's LUX-DPSSE-DOR Safety Security Vest, a quality high-visibility vest designed specifically for public security usage in any setting. Disorderly crowd wrangling isn't for the faint of heart, so make sure you're wearing the proper security gear to keep yourself visible in low light conditions. This multi-colored yet predominantly hi-viz yellow vest is crafted with 100% ANSI-rated and highly durable military-grade polyester mesh. This garment meets ANSI 107/2015 Type P Class 2 standard. This makes sure that public security officers will be more visible in some of the dimmest of conditions. To further increase visibility, Occunomix added 2 inches of silver reflective tape to this ANSI-rated men's vest. This reflective tape extends from the shoulders to bottom of the safety hi vis vest on both the front and back. At the waist, there are two more 360-degree strips of reflective tape that are a part of a black adjustable waistband. This yellow high-visibility vest is designed specifically for public security usage because Occunomix added the label “SECURITY” throughout the garment. That label can be found in contrasting black lettering within the silver reflective tape on the front of the utility vest. 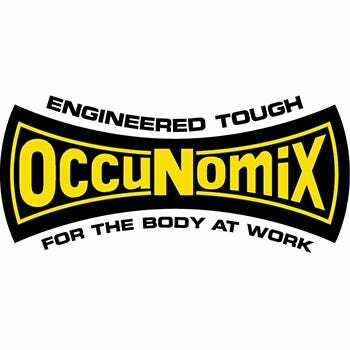 Occunomix also printed “SECURITY” in contrasting silver reflective lettering on the backside of the black adjustable waistband. That adjustable waistband is a part of an overall design that's meant to provide on-the-job comfort. A five-point breakaway zipper with loop closure and a quick release allows security officers to further customize the fit of this Occunomix vest. To provide even more utility, Occunomix also added two microphone tabs and two pen/badge holder pockets. The use of the highly durable military-grade polyester mesh ensures that this hi-viz zippered vest is rugged and naturally breathable. By treating this reflective vest with their durable Omni repellent, Occunomix built this garment to repel dirt, oil, and stains. The DOR solution also makes this water-resistant. These features make this a versatile garment that will allow public security officers to be safely visible in even the worst of conditions. We’ve said this water-resistant vest is military-grade because it's designed specifically for, and used by, the U.S. Military. Include the label “SECURITY” to a top-notch construction, and we feel this Occunomix Men's LUX-DPSSE-DOR Safety Security Hi Viz Vest from Working Person's Store is perfect for those who help keep the crowds safe at public events. Occunomix Vests: Men's LUX DPSSE DOR Safety Hi Viz Security Vest is being added to your cart.